A good point of reference is Nordkjosbotn where E-8 (from Tromsø) connects with E-6. Exit E-8 about 9km before you get to Nordkjosbotn (driving from Tromsø) This road runs through Lakselvdalen connecting to Lakselvbukt. Drive 13.5 km and look for parking on your left. This is very near Foramo. A trail starts here and connects to Rypedalen. I parked at a small turnout at location N69:21.677, E019:37.714, elevation 38 meter. Another, possibly better trailhead in the summer, maybe Djupen. 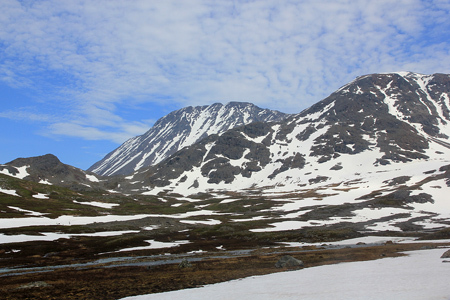 To get there, continue driving to Lakselvbukt, cross the river and drive back in the valley on the parallel road further east (Running on the east side of the river.) This route will have a small road for the first 2-3 km, one would then proceed up Rypedalen on the east (correct side) of the river and gain the north ridge to point 1358. This is an early summer route on the west side of the river. Proceed east towards Rypedalselva, then turn southeast along the river. There is a trail in the beginning. Continue up the valley, it pays to stay fairly high above the river. 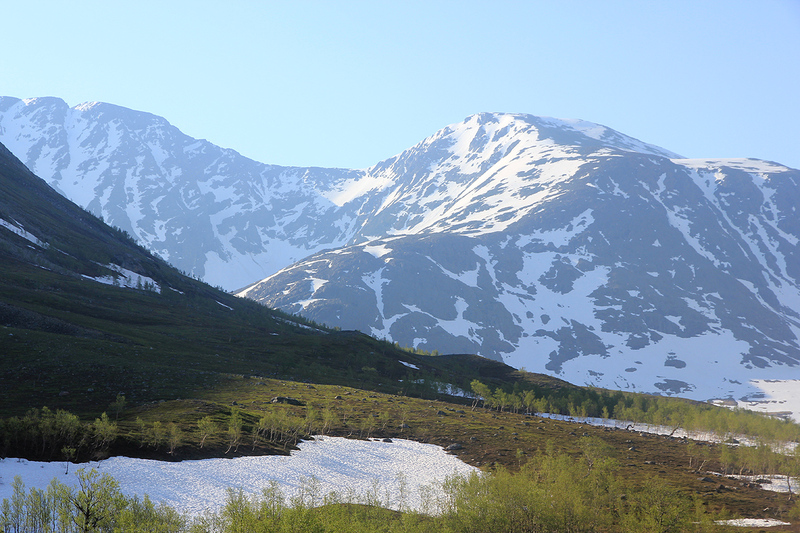 As you emerge from the birch trees, you will see the north ridge connecting to the west summit across the river. However, in early summer the river is too big to cross, this area seems to be the best place and it may be more attractive (to cross) later in the summer. 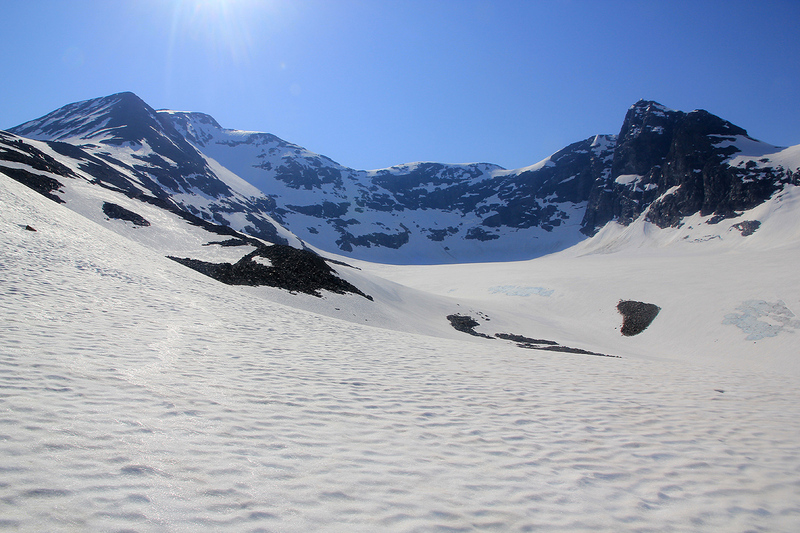 Proceed up along the river to the lake at 367 m. In this area, you may find a safe snow bridge, one could then consider going about 1 km northeast and access the north ridge. However, the alternative route that I used is pretty good and it has a somewhat more gradual climb. Thus, continue into the basin beyond the small lake. Angle left, there is a gully somewhat higher than where the creek drains the glacier above. A good waypoint to aim for is N69:17.820, E019:41.495, elevation about 510 meter. From here, the gully above is obvious, quite moderate snow, follow this until it tops out. Turn left and continue uphill. From here, you have a good view of the glacier below (that feeds the river), as well as the upper basin between Piggtinden and Rieppetinden. There are several minor variations, head uphill to the west summit, elevation 1356 meter, location N69:18.110, E019:44.611. From here you see the first part of the ridge route to Biellogaisa. Descend along the ridge to the connecting saddle, then start your ascent staying on the ridge itself. You may need to go slightly right of the ridge a couple of times, do regain the ridge as soon as practical. Higher up, climb slightly right and turn a corner onto a broader ridge, falling gently off to your left. However, the summit is still quite some way ahead. 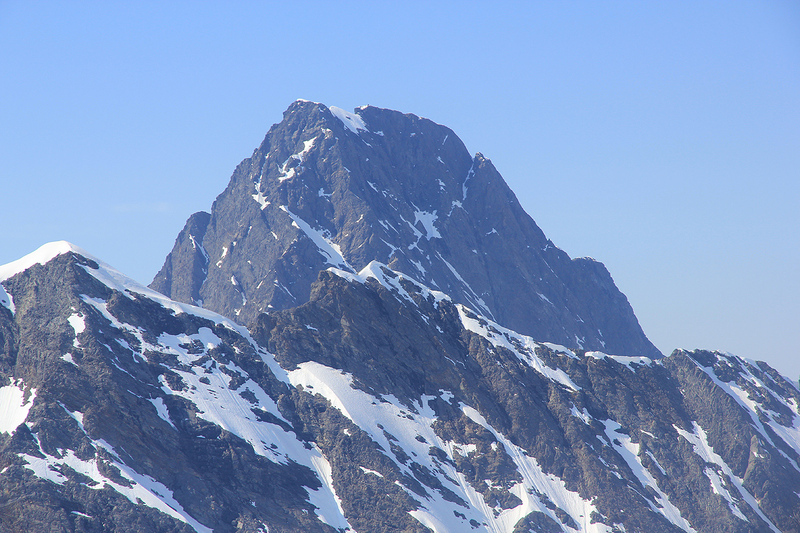 A small, pointed summit appears up front. Climb it and descend to a minor col at its far end. 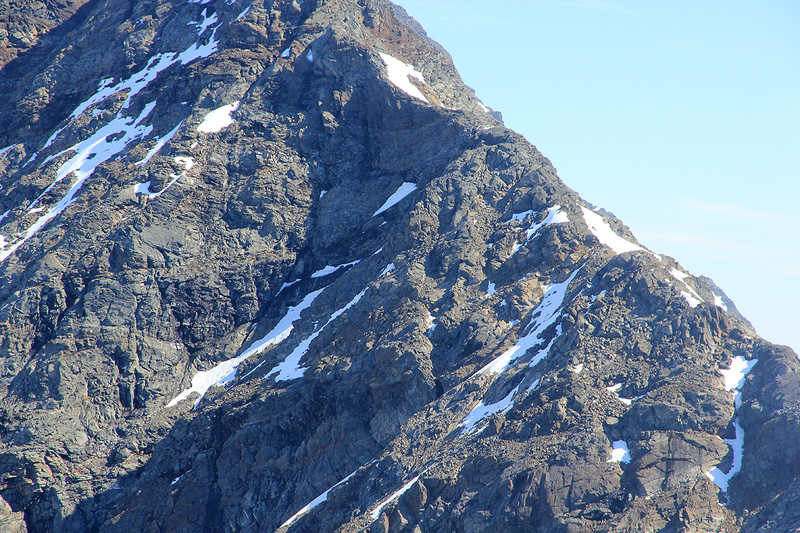 At this point the ridge rises steeply and cannot easily be climbed. 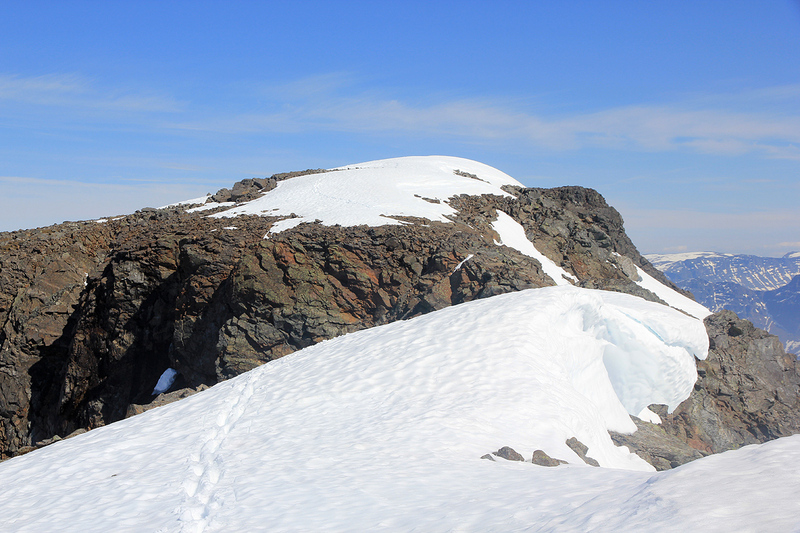 Go right and climb a steepish snowfield (at least in June), that subsequently regains the top ridge. 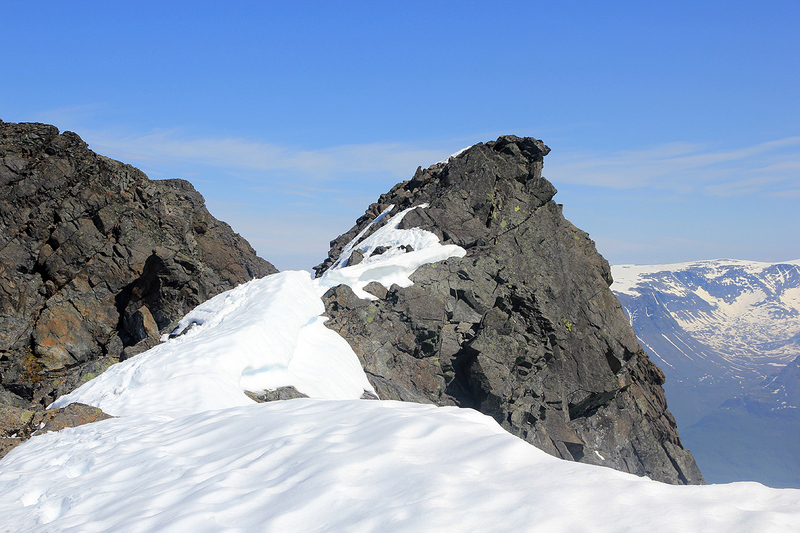 The ridge is now easier, but beware of cornices as you complete a final dip, then gain the main summit area. 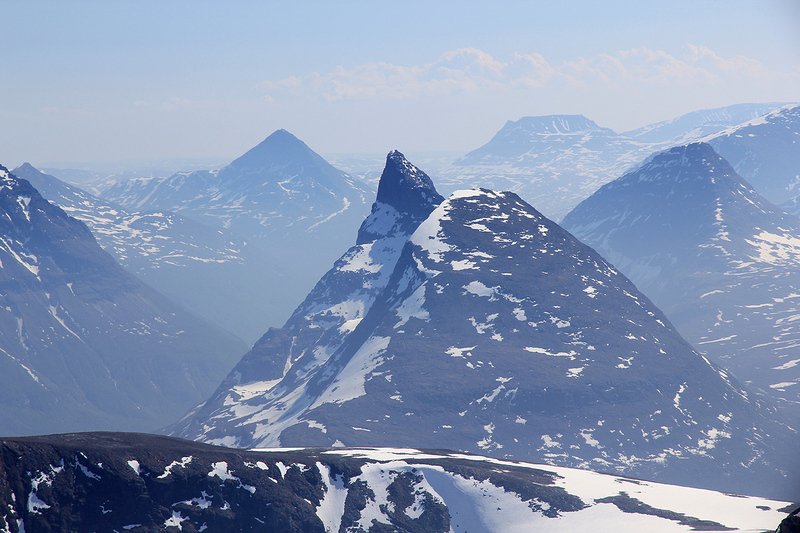 From here on, the ridge is wide as you gain the very large summit plateau. The forecast for the 3-day weekend in Troms was just phenomenal. I looked at it on Wednesday, then again on Thursday around noon. At that time, I also checked the airlines and observed that there were only a few (expensive) seats left. Busy at work, I finally got back to my airlines at 1700. Bad news, all flights on Friday afternoon/evening sold out. I called SAS and told reminded them that they had given me a guarantee of a seat if reserved 24 hours ahead of time. Thus, the 1800 flight tomorrow. OK, with flights taken care of, I needed a rental car. the 3 first agencies I called had rented all their cars. Bad news, now having a rather expensive ticket to Tromsø, I did not want to spend the weekend at the airport. Fortunately, Sixth had a stationwagon, just what I wanted. On Friday, my flight from Bergen was late and finally assigned an even later slot time, arriving only 10 minutes before my Tromsø flight in Oslo. Well, I made it. 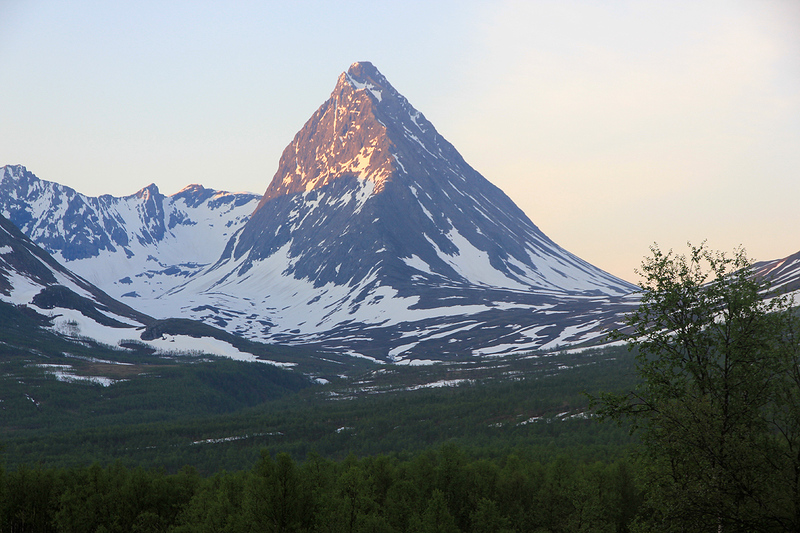 Arriving in Tromsø around 2230, the Sixth office was closed with a message to call a cell phone number. My call did not go through! In fact, it did not at all connect. Asking some people, I was informed that the entire cell phone network in Norway had broken down. The worst phone crisis since they started service. Just what I needed. After about one hour, the Sixth guy showed up, having no idea about my reservation. I got my car keys and rushed downstairs only to discover that my (brand new) rental car had no gas. Running upstairs, the guy had left and the phone system was still broken. 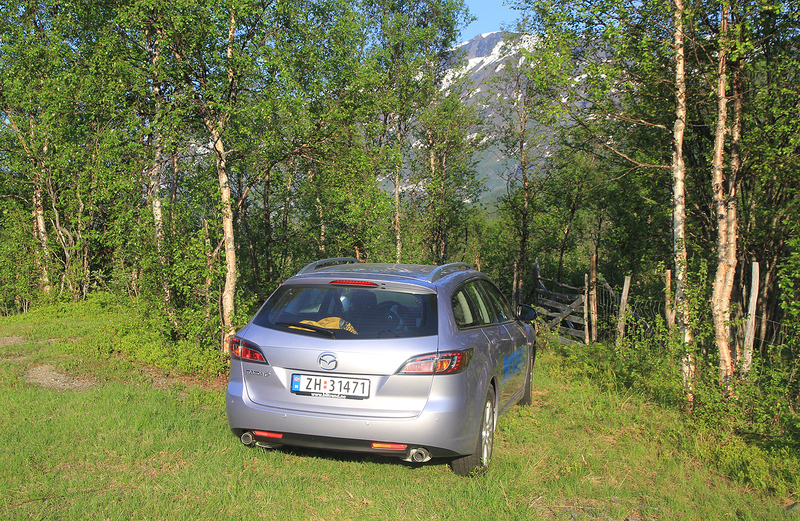 Well, I got the car to a nearby gas station, then proceeded to drive to my trailhead in Lakselvdalen. I parked at 0030, the sky was blue and the sun was high above the horizon. All initial trouble was erased from my memory, a three day adventure was about to begin. I woke up at 0600 and had a quick breakfast, then set off by 0615. The day was perfect, warm, blue sky, bright sunshine and a gorgeous landscape. I hiked across to Rypedalselva and immediately realized a potential problem. This river was BIG and my route intended to cross it further upstream since Biellogaisa certainly is located on the other side. Well, no need to worry too much, there was only one thing to do, hike upstream on my side of the river and hope that I would find a place to cross. 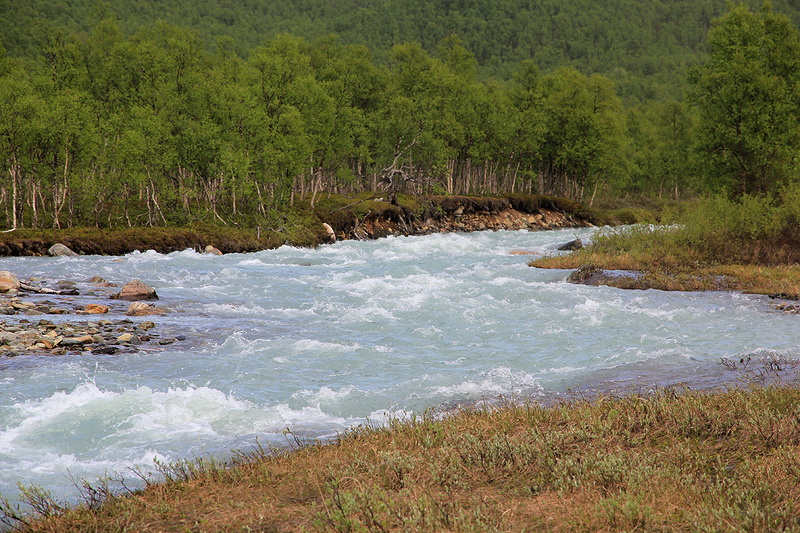 In the east part of Norway, one would need to walk 3-4 days in order for a river this size to become smaller. Here in Troms, distances are shorter. 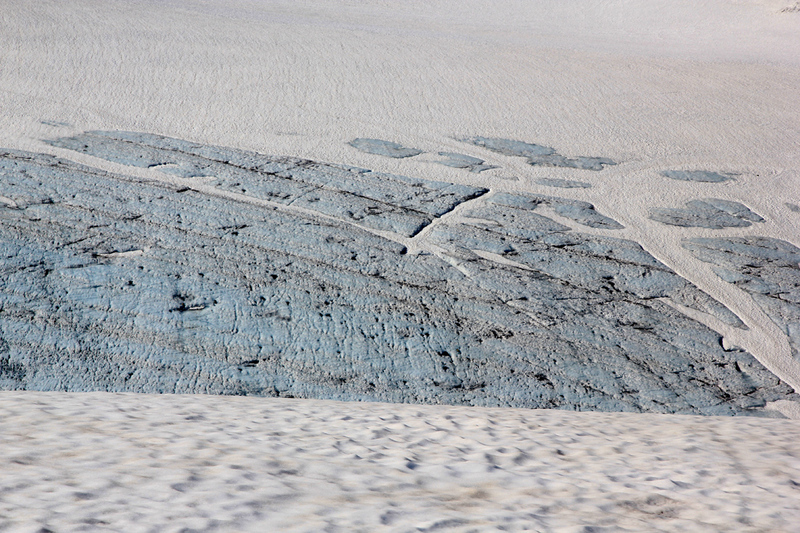 I examined my map and learnt that the worst case would be to follow this river until it emerged from a glacier. A detour that would change my climbing route, but not an option that seemed out of question. 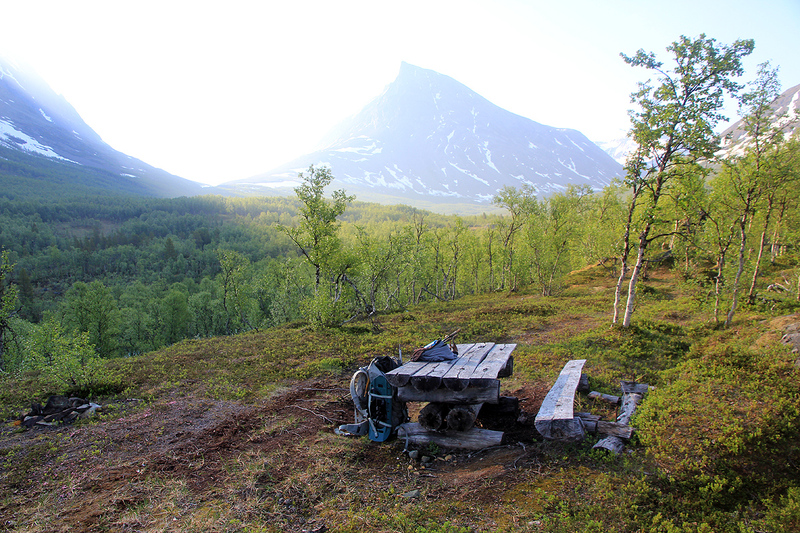 I followed a small trail that led me to a rest area, complete with table and benches. The trail gradually vanished, but the terrain was easy to hike. I came a bit close to the river a few times and made a mental note to stay somewhat higher on my return hike. The day was just perfect. This valley seemed wild and untouched by humans. 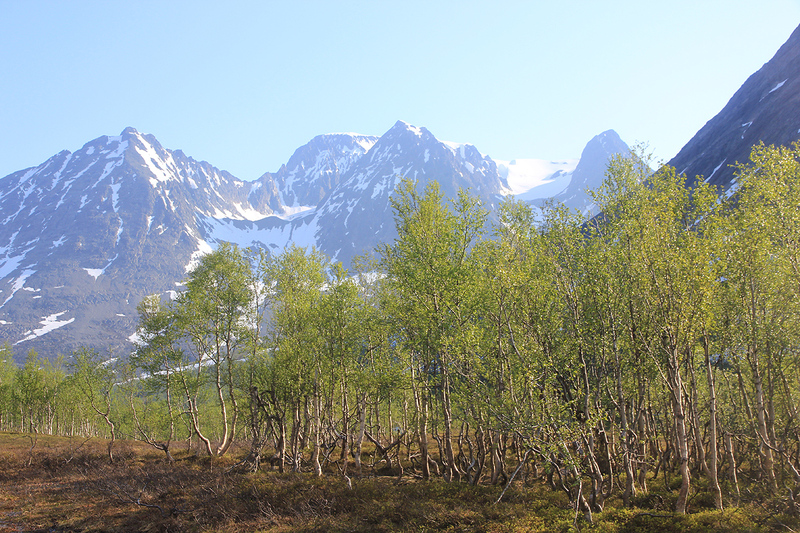 The birch trees slowly thinned and gave way to soft open land, still colorful as we left the sharp green of the trees that recently had come to life in the midnight sun. 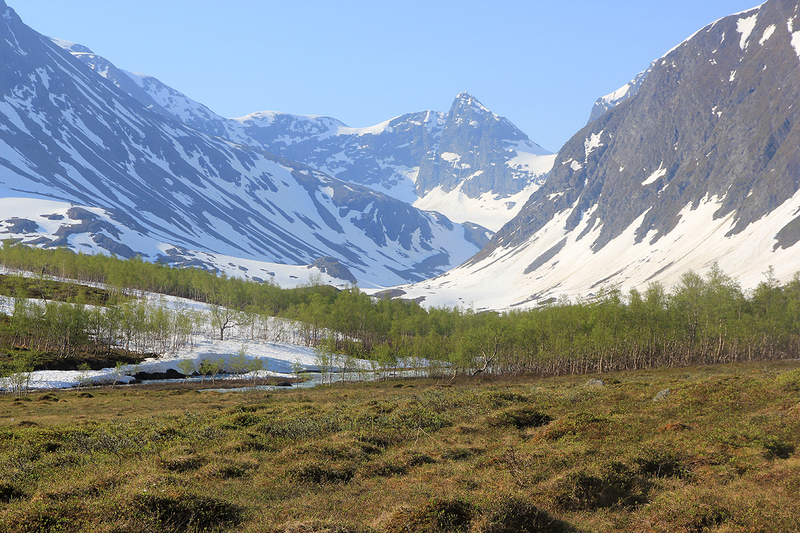 More patches of snow could be seen ahead, winter withdrawing as summer now had powerful forces working in its favor. The valley floor widening, the river forked into several separate channels and ran more quietly. 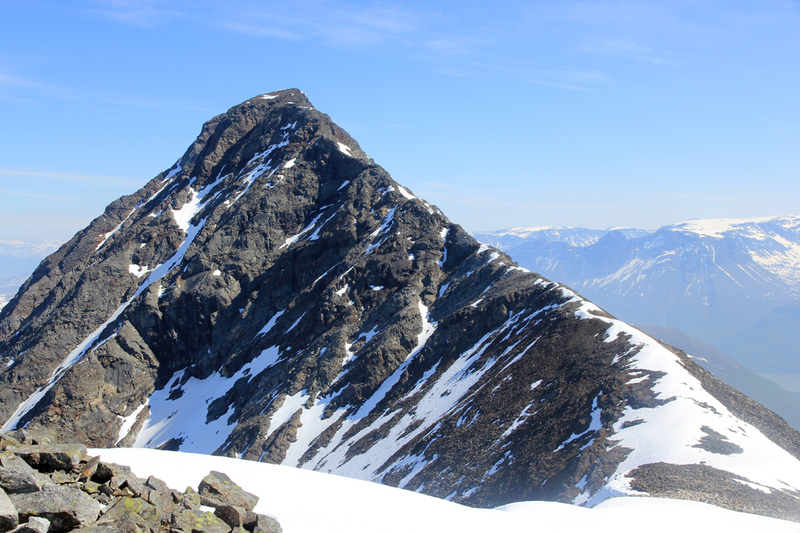 The planned ridge up to the north summit of Biellogaisa was right across. I walked along the river and looked carefully to see if it could be crossed without too much trouble. Clearly, one can get across here, but not without getting wet (at least to the knees) at this time of year. I decided against it and continued upstream. As the river ran more swiftly, I spotted a single remaining snow bridge that could provide a crossing. It looked pretty good, but the river ran wildly below. I decided that it was at least 99 percent certain that it would hold. Is this good enough in a situation like this? 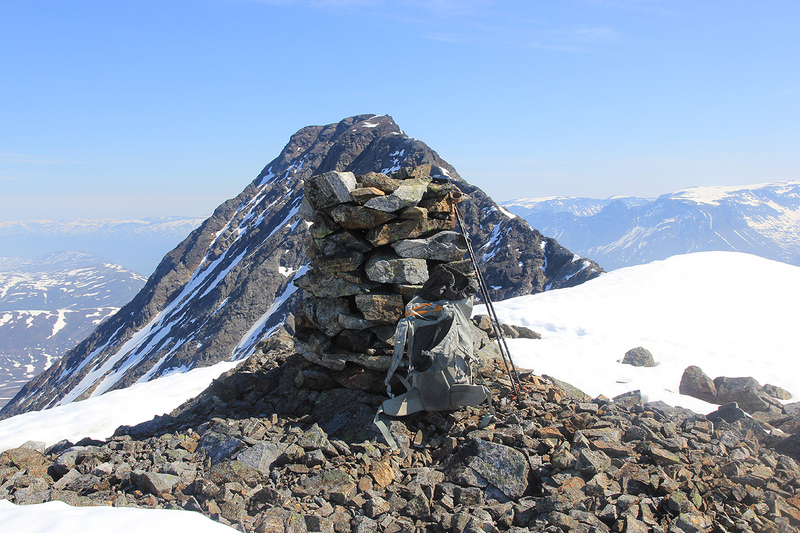 Obviously not, I now knew that my route would not ascend the north ridge, but rather the south ridge to the 1356m west summit of Biellogaisa. It was time to put on the snowshoes I had carried such a long way. I hiked along the west side of lake 367, and decided that my valley was about to end. 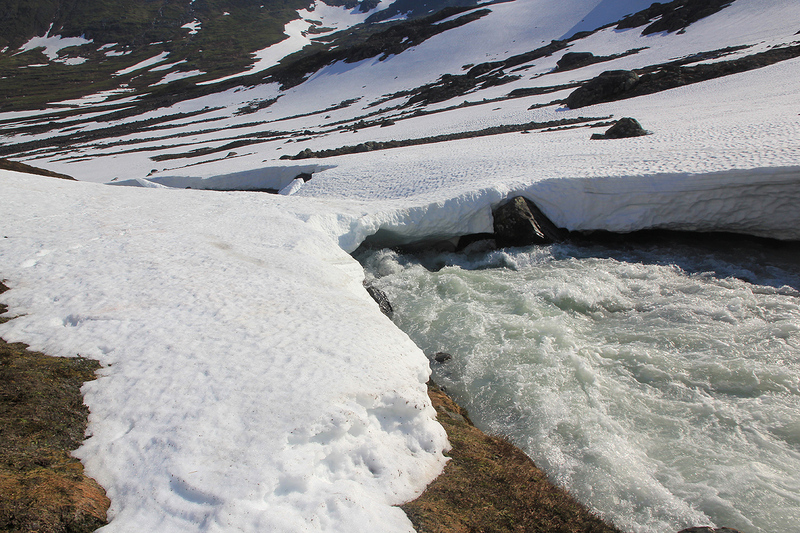 Plenty of snow here, no problem to cross the river that also forked into several smaller creeks in this basin. 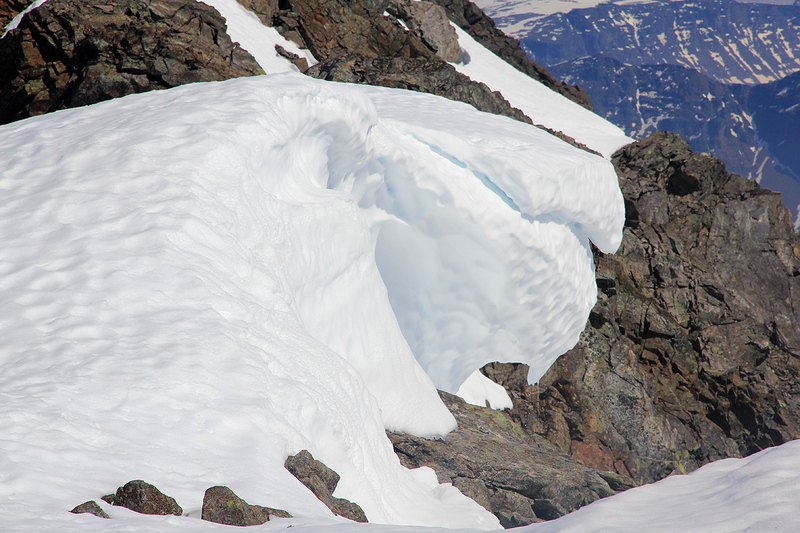 The snow gully up on the left side looked good for accessing higher terrain. I left my snowshoes and proceeded with no problems up the south ridge to the west summit, an important milestone reached afterv 5.5 hours of hiking. The climbing of Biellogaisa still remained, the ridge looked somewhat difficult, but often things sort themselves out as one gets closer. I decided to climb the dry rock along the very top if at all possible. To traverse out into the steep south facing slope did not look very attractive. 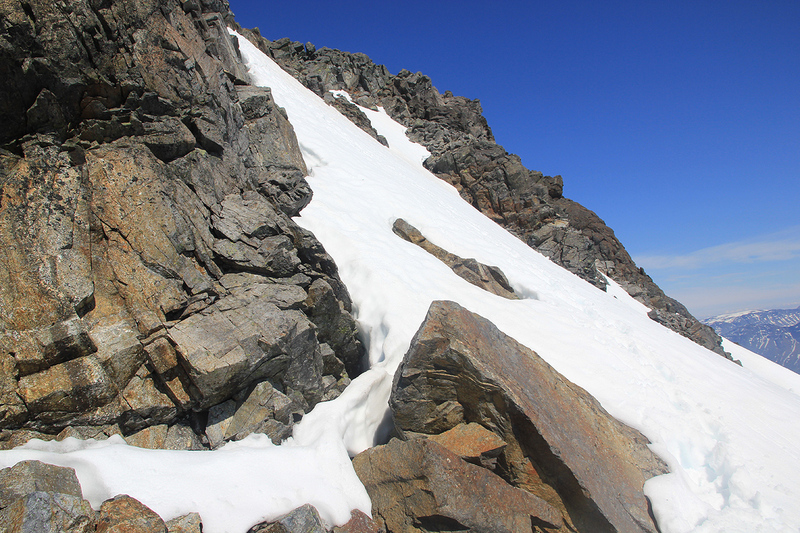 The snow seemed pretty rotten and the vertical drop was about 1000 meter. I quickly got into (YDS) class 3 scrambling and decided to leave my backpack behind to move more easily. The ridge required full attention and I needed to go somewhat right (into bad snow) in one spot. 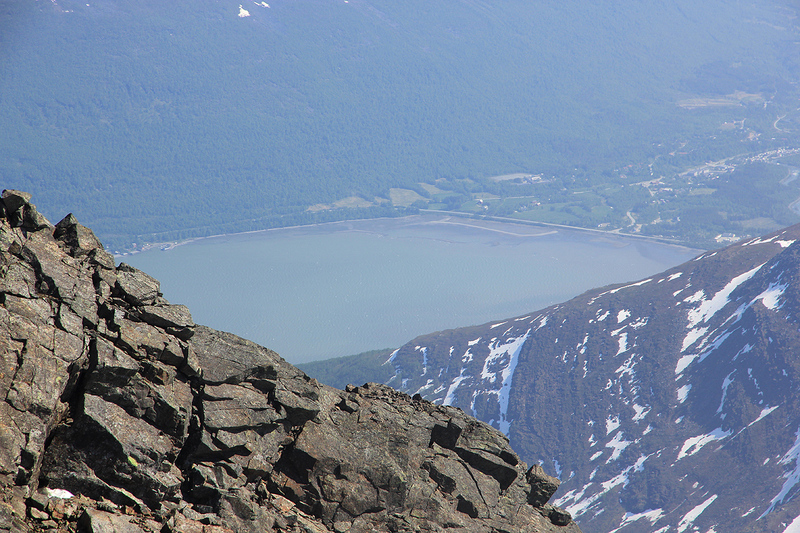 Staying high, I turned a corner near the top of the ridge and got on to a much broader part. For a moment, I believed that the rest would be easy. Wrong. A very pointed summit further ahead. It could not be bypassed and I feared the terrain beyond it. Well, the descent to a local saddle was ok, the continued ascent of the ridge too steep to even consider. I needed to do a somewhat steep climb on the snow slope to the right. 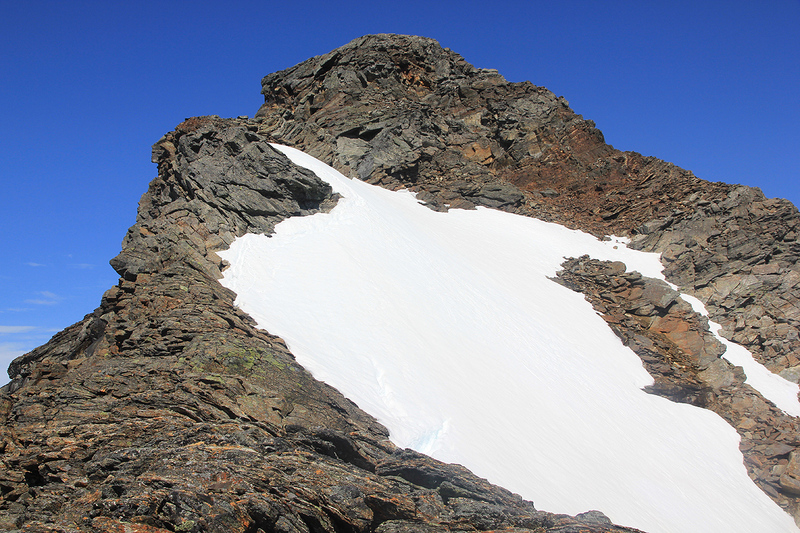 After some thought, I climbed the snow largely next to its upper left side with some handholds also on the rock. This all went fine and put me back onto the high ridge. The summit was now ahead and walking carefully at a respectful distance from cornices that could collapse any moment, I crossed the last little dip and arrived at the summit plateau. 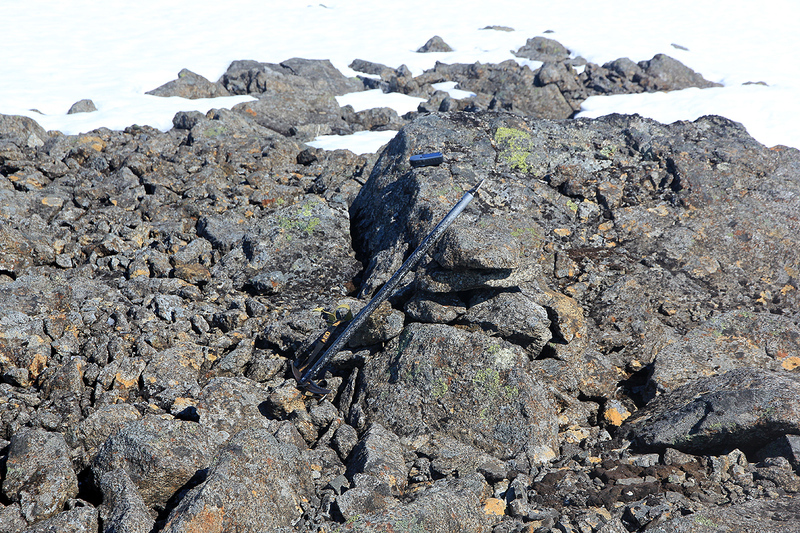 The highest point was marked with a mini-cairn (2-3 rocks), a somewhat larger cairn was located off to the left (but lower). Arrival at 1315, 7 hours for a one way hike, this was going to be a long day. 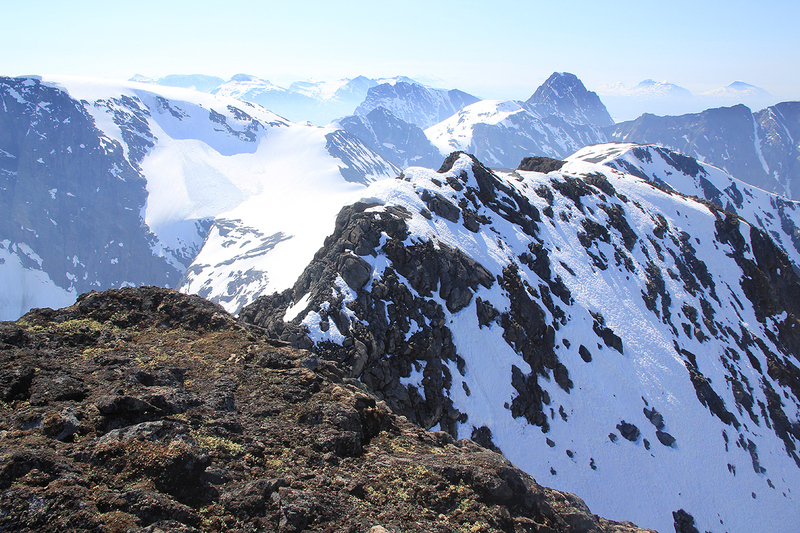 The weather was nice and the view super, I took my time to enjoy this isolated Lyngen summit. No other person within 5-6 hours of hiking. I left at 1345, and carefully retraced the precise route of ascent. 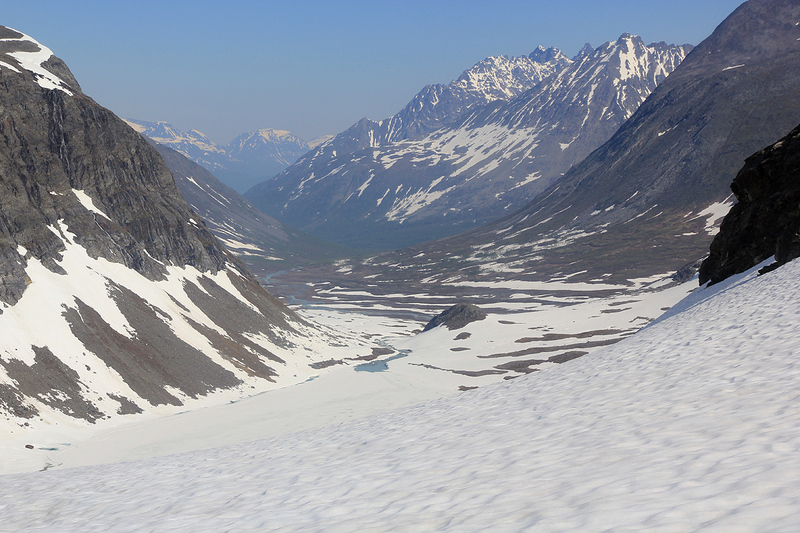 The descent to the lower gully could be done on snow and my route along the river got slightly optimized. Back at the car in 5 more hours. What a day, 12 hours of hiking in absolutely gorgeous nature. Moving from green farmers fields via a long valley to a sharp, alpine peak. This day will be a treasure for years to come. 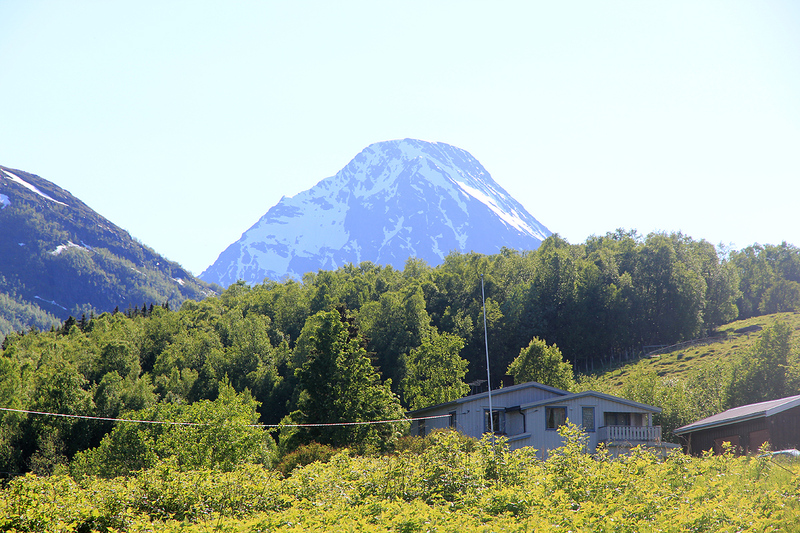 Biellogaisa, as seen from Storfjorden. Biellogaisa, as seen from Rypedalen. The upper part of Rypedalen. My route went up the snow gully that can be seen in the middle of the picture just below the rockface (located further behind). 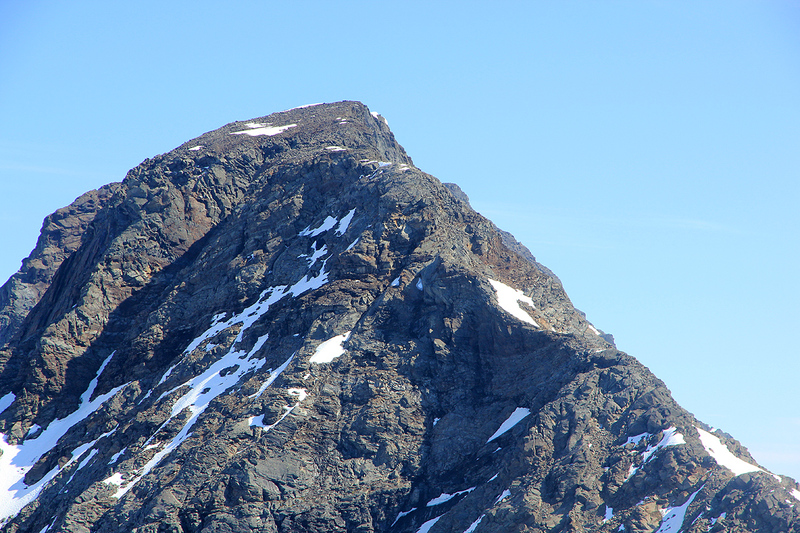 Biellogaisa, the west summit and part of the main ridge. The north ridge is in the middle. The river is between the pghotographer and the picture. Rypedalen, view back from the snow gully that got me to the south ridge. Piggtind, as seen on my way to the trailhead.